In this book, we seek to present to the readers, a sneak-peek into the past and present of the Tribunal and the Appellate Tribunal. The book will succinctly capture the role and responsibilities of both these bodies under all the legislations viz. Companies Act, 2013, Insolvency and Bankruptcy Code, 2016, Competition Act, 2002 (National Company Law Appellate Tribunal is the appellate authority under the Competition Act, 2002 vide the Finance Act, 2017). 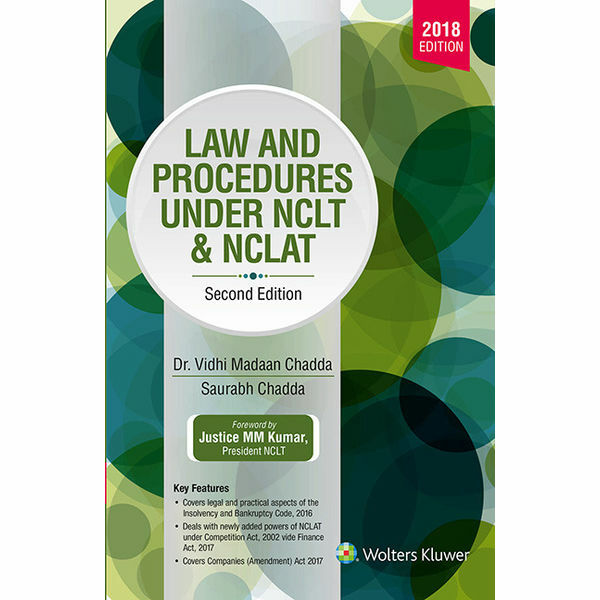 Mr. Saurabh Chadda, did his law from the University Law College, Bangalore and Masters in Business Laws, from NLSIU, Bangalore. He is practicing counsel before the Supreme Court and Delhi High Court. He is the Standing Counsel for ESI Corporation, Ministry of Labour and Employment at the BIFR and AAIFR. He has been the panel counsel for Competition Commission of India, Delhi Financial Corporation, Delhi Cooperative Housing Finance Corporation, Delhi Transport Corporation, EPFO and ESI Corporation. He has also been a Standing Counsel for Income Tax Department, Ministry of Finance at Delhi High Court. He has been appointed as Government Pleader for the Government of NCT of Delhi at High Court. He is a resource person for a number of government and non-governmental institutions like National Training Academy, Ministry of Labour and Employment, Directorate of Education, Government of NCT of Delhi and NIRC –ICSI. He has been a guest faculty at DTRTI- Bangalore. Dr. Vidhi Madaan Chadda is a commerce and law graduate from the University of Delhi. She is an associate member of the Institute of Company Secretaries of India. She did her Masters in laws (with specialization in corporate laws) from USLLS, GGSIPU and has qualified UGC-NET. She has been a research scholar at the Faculty of Law, University of Delhi. She has presented a number of papers at various national and international conferences. She has been a resource person for a number of government and non-governmental institutions like National Training Academy, Ministry of Labour and Employment, NIRC-ICSI and other regional chapters of ICSI. She has been a guest faculty at the NIRC of ICSI and has also been conferred with the “Appreciation award for Honorary services to NIRC” ICSI for the year 2011. She presently works at Vivekananda Institute of Professional Studies affiliated to GGSIPU as Assistant Professor (Law).